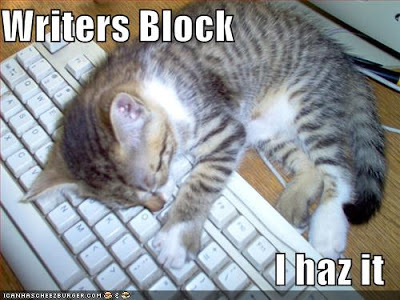 I have a serious case of writer's block. Not that I think of myself as some great writer but I do write. Just not as much lately. It seems whenever I sit down at the computer to write something for the blog I draw a complete blank. So I sit and stare at the screen for awhile and then I get distracted by FB or some other blog. I don't know what it is. I can't seem to think. My mind wanders or I think of something earlier in the day and then can't recall it. When I first started this blog I would compose posts in my head throughout my day. And then I started sitting down and writing multiple posts in a day and scheduling them out. Now I've got nothing. Except this darn headache yet again. I'm feeling a little frustrated by the whole thing. I have always enjoyed this blog and being able to talk about things on here that I find interesting or frustrating. And it's not as if I DON'T have things I'm frustrated about. Or even fascinated by. Maybe it's because I am finding out more and more that my family reads here. And I don't want to offend any of them or hurt any feelings. Or maybe its just because I mentally constipated. (Sorry for that image Lori!) Whatever it is I'm hoping it ends soon. I MISS my blog. I miss my writing. Pregnancy 101: Holy Belly Batman! 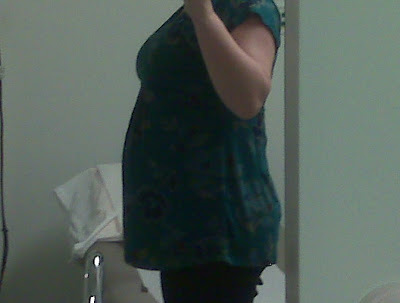 Here I am at 16 weeks in the doctor's office. I cannot even FATHOM how huge I'm going to be at 8 months. I'm doomed. Sorry for the fuzzy phone photo! 1. Italian dressing. I'm not even kidding. I just gagged. WHO IN GOD'S NAME INVENTED THIS? So gross. Oh and I've never hated it before. 2. Chicken. But only if it is plain. If you've got it smothered and covered I'm good. 3. BBQ sauce is the food of god's. I'm not kidding. I could eat it every day. My mouth just literally watered. 4. Starbursts. Hello sweet goodness. And I get the favorites pack. All pinks and reds. My lover. 5. Brushing my teeth. There I go gagging again. I do fine until about 10 second before I start going for the tongue. And then I start gagging. UGH. 6. Water. Can't smell at all. Can't have a taste at all. Prefer bottled for all those reasons. 7. Saltine crackers. Sand anyone? 8. Peanut butter crackers. The kind with the cheese cracker. Yummy goodness. 10. Cherries. UGH. I can't eat them without thinking of that movie with Jack Nicholson, Cher, Michelle Pfeiffer and Susan Sarandon where he makes them all throw up cherry pits. Double ugh. 10. The smell of the lotion/perfume the girl 3 cubicles back uses. I'm going to rip it from her hands and throw it away. Must you wear a GALLON of it? 11. The smell of my hubby when he gets home from work. It's a mixture of fruit and veggies and smells like straight compost to me. 12. Potstickers. Can't. Stop. Thinking. About. Them. 13. Taco Bell. I could eat it everyday. So there you have it. The short list. It makes for very interesting meal times. I'm starving but I don't know what I want. Can't figure out what I want. Crazy hormones. They just might be the death of me. Pregnancy 101: Is Forever Enough? I heard this song for the first time when the Dixie Chicks released their last album. When I heard it I just knew that I would be very special to me one day. I ran across it about 2 weeks after I found out I was pregnant and I bawled like a baby. And then last week I was driving to work and heard it again and the same thing. I was there when my oldest niece was born. I remember watching her being born and seeing her face for the first time and I was just overwhelmed. When I held her later I told my sister I couldn't even imagine how much she must love her because I was already so madly in love with her, ready to die for her and she wasn't even mine. I couldn't imagine what it must feel like to feel even more love for a child. Until I got pregnant. There are times that I think of my munchkin and my heart could just burst. My arms ache to hold him or her. The smell of babies makes my heart pound. My world is about to be rocked in ways I can't even fathom and I can't wait. Forever ISN'T enough. I am a creature of Habit. That's right. Habit with a capitol "H". I like consistency. I like things to be the same. Now this is not to say I don't handle change well. I'm not scared of it. I think it is usually the only thing that you can count on. I expect change to happen in my daily life at work and at home. However, there are certain times and places that I NEED to remain consistent. My routines for instance. I like my routines. They settle me. I'm a pretty high stress person, constantly on the go and my routines give me an opportunity to just chill out. Two examples. When I get off of work I do the exact same thing every time I walk in the door. Put away my purse and computer bag. EVERY. SINGLE. DAY. Yes this probably makes me somewhat of a weirdo but doing this totally de-stresses me. It's my way of shaking off my day. My other very important (to me of course) routine is my morning routine. Hubby gets up very early to leave for work and is always home by the time I get back. So my mornings are my one time of the day that is all mine. The TV is off (which it NEVER is any other time), I open up all the doors and windows, I eat my breakfast and check my email, FB, etc. Then it is shower time, make the bed, put my make-up on, do my hair, make my lunch, get dressed and out the door. Sometimes I listen to the radio while I'm doing this and sometimes I just enjoy the quiet. And it's usually one of the very few times that my dog is actually quiet too! Plus, I'm not a morning person so this is my way of waking up and dealing with the morning. Most my husbands day's off are during the week when my little morning routine plays out. And because he wakes up so early everyday I don't ever get up before him. By the time I am up he is getting out of bed and turning on the TV and clearing his throat and basically being the loudest person known to man. And this puts me in a GREAT mood. As you can imagine it would for any Type A, everything-in-its-place-and-a-place-for-everything, morning hatin' person. Plus, I'm pregnant. Barrel 'o monkeys. This was one of those mornings. I was grumpy from the moment my feet hit the floor. And there he was, my beloved, yawning as loud as he possibly can and immediately turning on ESPN. And there I was a crazy woman ready to rip his head off. You would have thought I was 16 again with all the huffing and puffing and stomping my feet I did. And then when I got in the shower and the water went cold, OH YEAH. Joy unspeakable. So here I was making a fool of myself, stomping around the house, mumbling under my breath when it hit me. Like a ton a bricks. Myself said, "HELLO YOU CRAZY IDIOT?! How about instead of acting like a big fat baby you actually ASK him for help. Ask him to leave the TV off until you leave and explain to him why!" Well I really blew myself away with that one. Be reasonable? Who'de a thunk it? So that's what I did. I sat down next to Hubby and explained my predicament and he said, "Okay" and turned the TV off. Blessed silence. Just goes to show that sometimes husbands really do listen and wives get just a little too overwrought. So after my horrific experience with Dr. Ice and her ultimate firing I was rescheduled for another visit from Dr. Gentle. I have to tell you. . .what a difference a little bedside manner makes! And somehow I don't think I'm the only person that has had issue with Dr. Ice because when the nurse took me back I explained the whole sordid tale to her and that Dr. Ice had told me to not bother coming in. The look the nurse gave me said it all. She wasn't the least bit surprised. I met with him on Monday and he was nothing but nice. He is one of those nice older men that pats my arms and gives you that sympathetic smile. He did a thorough check of everything that could possibly be causing the bleeding and wasn't able to come up with anything or any reason. Everything is progressing just as it should and both the baby and the uterus are growing (which my very tight pants could have told you that!). We checked out the baby again and he was just floating around taking it easy. Very strong heartbeat. So all in all everything looks fine. Dr. Gentle says that no bleeding is normal but sometimes it does happen and they can't explain why. And then he told me twice that if I wanted or needed to come in once a week to just feel better he would be happy to see me. WOW. A doctor that is sensitive to your needs. What a concept. All in all I'm feeling much better. I feel as if my doctor is on my side and will be willing to help me out if I need it. I'm still going to see my midwife but I will feel much better knowing that if I need or want to see a doctor I have someone that will be willing to take the time. Physically things are getting better too. The bleeding seems to have stopped and so has the cramping. I think this weekend I might go out and buy one of those heartbeat monitors for home just so I can listen to my munchkin and make myself feel better when I need to. Thank you all for your love and support and prayers. You will never know how much it has meant to me. Truly. Dr. Ice it OUT. I spoke to four different people at Kaiser on the phone today. Two were patients relations and two were advice nurses. They were all appalled at Dr. Ice's behavior. I was apologized to profusely and assured that I wasn't being over zealous. So she was promptly replaced and I see my new doctor, DOCTOR GENTLE on Monday. Until then I'm to enjoy my weekend with my feet propped up ordering those around me to wait on me hand and foot. I'm trying to keep my wits and sense of humor about this whole thing as much as possible. Thankfully I have some girlfriends coming into town tomorrow to distract me. Thank you all for you kind words, your encouragement and your words of advice. It means the world to me.